Mobile banking customers can now choose to 'switch off' certain types of spending, in a move which could put people struggling with addictions more in control of their finances. The new feature launched by Barclays could help those dealing with gambling problems, for example, to cut off their spending in betting shops and on gambling websites. Barclays said it has developed the tool to turn off certain types of spending with vulnerable customers in mind. How can you 'switch off' spending? 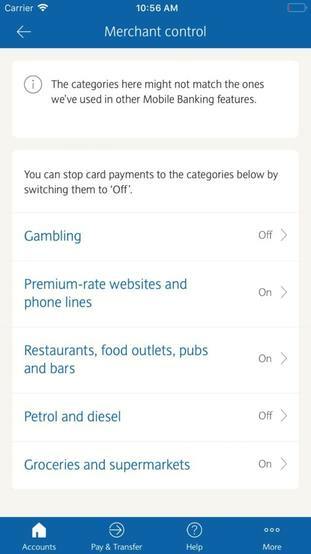 A button within the Barclays mobile banking app enables customers to choose which types of retailers they are able to spend with. People can also block their own spending in pubs and bars. Where can customers control spending? The new feature is now available to all Barclays debit card customers, and will be rolled out to credit card holders in the near future. Barclays said it will help all its customers take greater control over where their money can be spent. The bank’s work has used research from the Money and Mental Health Policy Institute set up by consumer champion Martin Lewis. It also worked with the Money Advice Trust (MAT) to identify types of customer who would particularly benefit from being able to decide how and where their money is spent. These include people with mental health issues and addictions as well as those who rely on carers or a guardian to handle their finances. Martin Lewis said he hopes other banks will follow suit. Catherine McGrath, managing director at Barclays, said: "This new control feature is the latest new service that we have introduced in the Barclays Mobile Banking app that aims to give all of our customers a better way to manage their money in a simple, secure and effective way." Chris Fitch, vulnerability lead at the MAT, said: "Technology that meets everyday banking needs, while recognising the challenges many of us face in our lives, is the way forward. "Giving everyone more control is the key to achieving this - whether this is someone who wants to be less vulnerable to fraud, or a customer who is trying to take charge of their gambling."